Birthday invitation printers of full colour A5 birthday invites printed and delivered to England at very competitive prices. Bithday invitation printers online of high quality birthday party invites and envelopes at very competitive cheap printing prices. 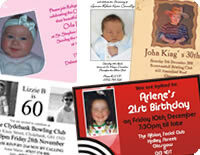 We supply birthday invitations throughout the United Kingdom. All invitation card printing prices include a free online artwork checks prior to printing. Birthday party invitation card printers fast delivery of party invites to England. A5 party invitation cards printed full colour party invitation cards, printed onto 260 gsm satin art board. 7 to 10 day printing prices based on supplied artwork. Click on prices for costs us creating the artwork. Invitations can be supplied with C5 white self seal envelopes. Full colour two sided party invitation cards, printed onto 300 gsm gloss art board. How to upload PDF artwork for your party invites or invitation cards or commission our designers. Design and artwork. Let our creative design team design you effective professional looking artwork for your invitation cards. Free mailer card artwork checks or use our low-cost design and artwork service. We offer a competitive nationwide birthday party invites, event and function invitation card printing service to and the rest of the United Kingdom. Competitive Printing Ltd © 2014 Terms &amp; Conditions.